tenant has to live at least 50 kilometres away from the property ! ! ! for rent: this completely renovated and fully furnished studio with private facilities. 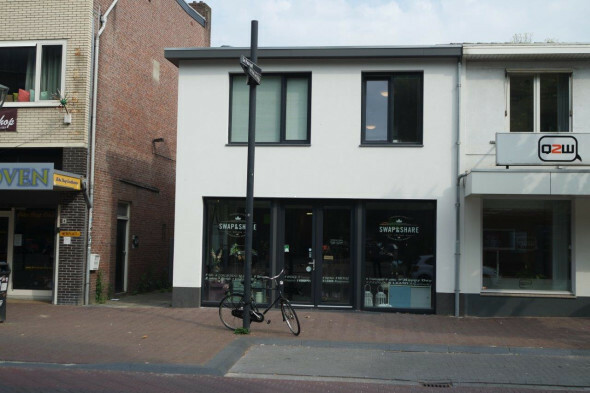 The studio is located on a very unique location at the cosy st. Trudoplein within short distance of the city centre. The studio is situated within a renovated and luxurious finished complex with 4 studios in total. at the st. Trudoplein all possible shopping facilities are established such as stores, restaurants, supermarkets, a bank and bus stop. The renewed area strijp-s and the train station are located within walking distance. There are many public and paid parking spots available in the area. communal entrance at the ground floor with staircase to 1st floor where the studio apartments are situated. the studio is accessible via a private roof terrace at the rear of the complex. Entrance in studio of approx.29 m2, where the modern open kitchen in wall arrangement is located. The open kitchen is equipped with induction hob and extraction hood, dishwasher, built-in refrigerator, combi oven and various storage options. fully tiled bathroom with toilet, sink and shower. The studio has a storage room with cupboard and connection for a washing machine. On either side of the studio there are large windows which provide a lot of natural light in the studio. The entire studio is equipped with durable pvc floor with wood motif. the studio is fully furnished and is equipped with a single bed, wardrobe, sofa with coffee table, tv cabinet with flat screen tv, lamp and dining table with 2 chairs. The studio is also equipped with washing machine, vacuum cleaner and iron. Interested in this studio for rent?